March 18 is the anniversary of the 1937 Texas School Explosion, a gas explosion that killed more than 300 people, mostly students, in their new state-of-the-art public school where no expense had been spared except when it came to safety. Every year, to mark the anniversary of this preventable tragedy, I salute someone with an extraordinary sense of responsibility and commitment to the safety of children and their communities. It is also an annual opportunity to talk about the 1937 disaster’s unfinished legacy and its lessons. It is a story of how school, town and company officials had ignored warnings and agreed to look the other way as their shortcuts in building design and operation endangered a whole generation in a small East Texas town. As a result, gas accumulated in a basement area next to a shop class where a spark set off the deadly explosion at 3:17 pm just minutes before the final bell. Saluting Investigative Journalist Itai Vardi. Itai Vardi is dedicated to exposing the patterns of corruption and distortion in the health and environmental impact assessments and the permitting of fossil fuel infrastructure projects. He reveals how individuals and groups associated with climate denial or science obfuscation violate scientific standards. He doesn’t take it for granted that public officials and elected representatives prioritize community safety and health. Vardi’s articles repeatedly uncover how officials silence the truth about hazardous conditions, especially in neighborhoods overburdened with contaminated conditions and high rates of cancer, respiratory and coronary illness. Boston University Professor Nathan Phillips calls Vardi’s work the best of what investigative journalism can be. Indeed, our communities need champions who have the courage to expose conflicts of interest and speak out against false claims and empty assurances, especially when warning signs and hazards are ignored, public concerns are dismissed, and ethics, rules and standards are violated. Yes, it is painful to threaten the illusion of safety in a school or community and to talk about death and loss. The New London School Explosion survivors did not talk about their painful experiences for more than forty years. Their stories clearly teach us that it is even more painful to live with a tragedy when opportunities to prevent loss were unseen or overlooked. Itai Vardi writes about the conflicts of interest, the revolving door between government and the private sector, and the hidden relationships between elected officials and gas companies and their lobbyists. As one example of many, Vardi Revealed Massachusetts’ Governor Charlie Baker’s close ties to lobbyists for Spectra Energy, whose pipeline projects he backs (DeSmog, Itai Vardi, February 28, 2017). In an interview last week, Vardi says, “My job is to raise questions, to use the information I’ve discovered and uncovered. I continue to discover discrepancies between internal documents and public statements, by exposing the agreements being made behind closed doors.” He has reported on oil and gas infrastructure projects throughout the U.S., including in Michigan, Pennsylvania, Virginia, and more. Much of of his current focus on the fossil fuel industry’s influence on bodies that are supposed to regulate it began in 2016, when he published Exposed: Spectra-Funded Group Lobbied for FERC Commissioner’s Reappointment, Then FERC Approved Spectra’s Gas Pipelines, (Desmog, Itai Vardi, May 20, 2016). Someone who saw Vardi’s article about lobbying, third party contractors, and conflicts of interest reached out to give Vardi more information. “Many of my stories snowballed from there,” he says. Vardi’s stories show the necessity of investigative journalism to break the silence about community hazards and promoting a culture of responsibility — especially by showing the undue influence of industry interests on government bodies who often use consultants with financial stakes in the projects they are evaluating or permitting. In one such example, he found that a Forest Service’s “independent” report on the Atlantic Coast Pipeline was actually written by the pipeline company’s contractor” (Desmog, Itai Vardi, April 25, 2017). Vardi’s questions have been particularly useful in exposing the lack of integrity at many points in the process of permitting the proposed Weymouth Compressor Station project in Massachusetts. Vardi’s articles have given community members insight and evidence to seek accountability from government and elected officials. Physicians and other scientists have joined with local officials and community activists such as Fore River Residents Against the Compressor Station to challenge the false narratives and conflicted studies, and to appeal the state permits. 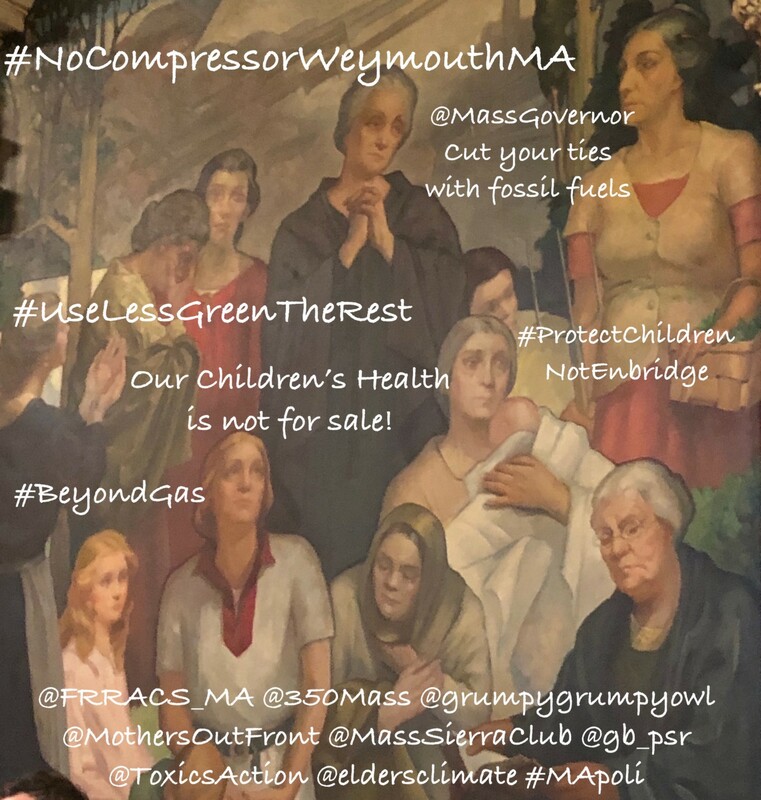 Greater Boston Physicians for Social Responsibility report ‘Health Risks of A Proposed Compressor Station in Weymouth, (February 7, 2019). The South Shore delegation of mayors and representative used Vardi’s research to highlight conflicts of interest in the Compressor Station process when they met with state officials. Vardi’s work also strengthens the community partnerships that provide evidence of health impacts of fracked gas all along the supply chain. Outraged residents “flooded both Warren’s and Markey’s offices with requests for intervention” after Vardi revealed that Massachusetts regularly allowed energy companies, including Enbridge, to edit draft pollution permits, (DeSmog, Itai Vardi, May 23, 2017). And following his revelations on conflicts of interest in the federal review of Spectra Energy’s (later Enbridge) Atlantic Bridge project (DeSmog, Itai Vardi, July 31, 2016) U.S. Senators Elizabeth Warren and Ed Markey wrote to FERC Chairperson Norman Bay, citing DeSmog’s findings at length and expressing serious concern over the integrity of Atlantic Bridge’s environmental assessment. Vardi also found evidence that, despite Governor Baker’s claims that the health impact assessment report by the Metropolitan Area Planning Council was broad and comprehensive, the Massachusetts Department of Environmental Protection and Department of Public Health had edited and watered down the report, removing references to the contribution of fossil fuels to climate change. The Metropolitan Area Planning Council’s executive director published a statement admitting that their analysis, in fact, was rushed and limited. The report didn’t include significant safety issues such as fire and explosions. And furthermore, he didn’t support new gas infrastructure. (Agency Head Voices Opposition To Proposed Weymouth Compressor Station, WBUR, Barbara Moran, February 7, 2019). And, “More great inside malfeasance uncovered by @itai_vardi This time on Gov Gina Raimondo of RI.” Juliet Schor Retweeted, March 12, 2019, Exclusive: Rhode Island Governor Nixed Agency Critiques of LNG Facility, Silencing Health and Justice Concerns, Desmog, Itai Vardi, March 11, 2019. Itai Vardi was born in Israel and grew up in both the US and Israel, where he worked as a journalist for 7 years. He earned undergraduate degrees from Tel Aviv University in philosophy and political science and a master’s in sociology. Another of his professors was writing a book on the history of Israel’s biggest infrastructure project, a north-to-south toll road built in the late 1990s. There were protests and a major struggle but the highway got built. The story of the toll road focused Itai’s interest on environmental issues. The toll road had enormous environmental ramifications for land use, inequities in transportation, and pollution. The project took land mainly from Palestinian citizens of Israel. It increased the number of automobiles and spawned significant ancillary development — the growth of suburbs, malls, and gas stations. He saw how multinational corporations were pushing Israel’s globalization and that ordinary citizens didn’t so much benefit from international capital investment as they were burdened by the costs and damages. Vardi came to Boston University in 2006 to get his PhD in sociology. He did his dissertation on how the US government and media discourses “normalize” traffic accidents, convincing us that accidents were a “necessary evil” — a regrettable yet largely unalterable price to pay for the benefits of the automobile. Then Vardi did his postdoc at BU studying the sociology of science with Laurel Smith-Doerr who is now at the Institute for Social Research at UMass Amherst. Vardi says much of his insights and work was shaped by two books. One is Charles Perrow’s book Normal Accidents, an analysis of the inbuilt risks of large technological systems. The other is Eviatar Zerubavel’s book The Elephant in the Room: Silence and Denial in Everyday Life , about how social norms and structures can create conspiracies of silence, denials of social realities, and the stifling of voices trying to break the silence. It shows how silence, contrary to our intuition, actually grows over time and when more people see the “elephant” in the room. Breaking the silence thus becomes a moral, nonconforming act. In 2015, with a growing interest in energy policy and the fossil fuel industry, he decided to go back to journalism. He had no formal training in journalism but had highly developed skills in research, data analysis and interpretation, and interviewing. He first published in DeSmog, a news website that specializes in climate change denial, global warming misinformation campaigns, and the undue political influence of the fossil fuel industry. Vardi’s articles have also appeared in The Guardian, the Huffington Post, Mother Jones and other publications. “I’ve read Itai’s work carefully for the past few years. His writing has literally changed the way we understand how the monied and powerful interests work in our society. We may prefer to live in a happy naive world where those interests act benevolently on our behalf. But they do not. And we know this in part due to Itai’s important work. I imagine he must have some great probing journalistic vision to have uncovered so many dark secrets. And I do know he brings a real integrity and courage to this work, that he is not afraid to stand up to those monied and powerful interests. We are so fortunate that Itai follows our travails along with us and makes his own special contribution to our greater good.” — Dr. Curt Nordgaard is one of the founders of the Massachusetts Health Professionals for Clean Energy, a grassroots organization working to raise awareness of the hazards of fracked gas and fossil fuel infrastructure and advocating for the transition to clean energy sources. Photo Goldberg, February 7, 2019. Mural, Massachusetts Statehouse. Mothers Out Front demonstration tags added.